The frictional heat generated by breaks when decelerating a vehicle can have various negative effects on the brake system. Besides possible thermal cracks in the brake disks, premature wear or brake failure, an additional critical aspect is an increased braking distance can occur as a result of friction coefficients changing with higher temperatures. Ankers supports its customers in the development of new products by providing simulation, design, and development services. Among other areas, the company specializes in special car development from scratch including electrical and ICE vehicles, one of f super cars, and race cars for several European and Chinese automotive OEMs and tier one suppliers. Ankers' engineers aim to be at the forefront of technology and are using state of the art tools and development methods. One of their chosen tool sets is the Altair's HyperWorks suite, with which Ankers' simulation team has been working since its foundation in 2014. The tools have been used in numerous simulation and development projects, among others for structural analysis and optimization tasks. Especially in e-mobility projects, but also in any project in which the entire system with all its different aspects has to be developed. Co-simulation and a model based development approach of fers answers, which an approach that only considers single applications can't provide. So when co-simulation became a topic for Ankers, the engineers turned to Altair to see what the software provider had to offer. In one of the company's recent projects, the Ankers’ engineers conducted a feasibility study to determine the thermal influence on a brake system. To do so, the engineers made a co-simulation, applying MotionView, the multibody dynamics tool of the HyperWorks suite, and Activate, a solution to simulate and optimize multi-disciplinary systems using a 1D approach. The goal of the study was to show that simulation results would be more accurate when considering the thermal effects via co-simulation and to demonstrate the company's co-simulation competences to its existing and future automotive customers. The models used in this study were a full vehicle model and a model of the brake system, comprising of the brake disk and the brake pad. Both models were created in MotionView, using some of the various system templates the software offers via its vehicle library. To include the thermal influence caused by the energy conversion during braking, the multi-body system was co-simulated with Activate. In this way it was possible to study the influence of the temperature due to the disk-pad contact on the braking distance. The co-simulated model was set up in MotionView (multi-body system plus advanced driver) and Activate (friction-thermal dependent model). From MotionView the line pressure and the wheel angular velocity were fed into Activate to compute the friction coefficients according to the thermal model and the hydraulic circuit. This result was then again fed back into MotionView to update the properties of the acting model components. The simulated maneuver was braking on a straight route; the analyzed brake system can be ventilated through testing data. In this case, a non-ventilated model was used. Determine the thermal influence of brake discs and brake pads on the braking distance of a vehicle in order to optimize system behavior. Co-simulation using a combined multibody and brake systems model in Altair MotionView and Activate. Co-simulation leads to more accurate results, opening the way for further system optimizations by including thermal and other effects, already in the concept phase of the design process. Altair offers all the solutions to handle our tasks. Their tools are very easy to use, especially regarding the interface MotionView/Activate. Co-simulation is very helpful to study complex models in an easy and fast way. Especially e-mobility is an increasingly important topic that involves constant innovation. Working on multi-body systems with MotionView makes everything easier because it already contains important libraries such as: suspension system templates, tire models, advanced driver etc., which help to save time. 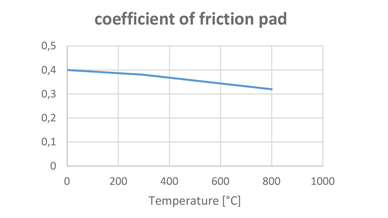 The results received from the co-simulation showed an increased braking distance caused by a reduction of the friction co-efficient when the braking pad's temperature increased. After the analysis with the co-simulated model (MotionView/Activate) the results were compared and validated with results from an existing complex model taken from literature. The results from the literature were then included into the MotionView/Activate model to validate the Ankers model. The results (1D) showed a very good correlation with the 3D model. After that, a braking maneuver in a straight line (showing the braking distance) was analyzed. The results showed that the co-simulation results were more accurate than those received from a multibody simulation only. When the temperature is taken into consideration, the example model shows that the vehicle would stop after 54m; without considering the effect the increased temperature has on the system, the simulation model resulted in a stop after 50m. Four meters, that really can make a difference when developing a brake system, hence the received results showed that the temperature has an important effect on the brake system. To receive more accurate results at the early stages of the product development process, this effect has to be considered already within the concept phase of the project. The good results Ankers received with this study proved that Ankers is prepared to include cosimulation into their service portfolio. The study also shows that Activate offers a perfect addition to multibody systems, providing the possibility to include block diagram models to complete the overall system in a very easy manner, that makes it look “natural”. In this way the engineers can stay within their familiar simulation environment while contributing to the system approach. In the next step the study might concentrate on the thermal model, considering also the increase of the temperature of the hydraulic oil (and other effects, to create a more detailed model) and how this influences the performance of the overall braking system. Another possible study would be to analyze the same system when it is ventilated. 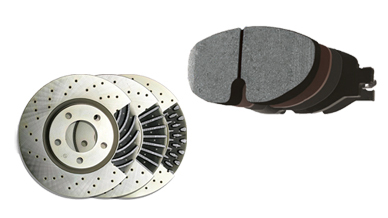 Higher temperatures in the brake pad/brake disk system leads to a lower friction coefficient which causes an increased braking distance. 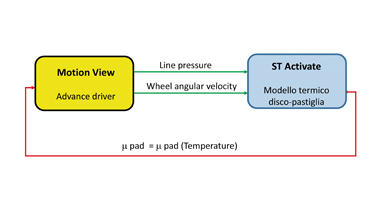 In the co-simulation, the line pressure and the wheel angular velocity is sent to the Activate model to determine the temperature and the related friction coefficient. In a braking situation most of the kinetic energy is converted to heat causing a lower friction coefficient. Ankers is a dynamic high tech engineering services company for the automotive and aerospace industry, located in Turin, Italy. Founded in 2014, Ankers supports its customers in the development of new products by providing simulation, design, and development services.